Today, Governor Kay Ivey introduced two major parts of the Gulf State Park Enhancement Project, the Interpretive Center and East Pedestrian Bridge. The first look took place at the newly constructed Interpretive Center located at 22250-A East Beach Boulevard, adjacent to the Beach Pavilion. These facilities create a gateway to Gulf State Park, inspiring visitors to explore the park’s 6,150 acres and connect to nature. The Gulf State Park Interpretive Center acts as a gateway to the park that welcomes all visitors to the natural beauty of the park. Divided into three major components, this building will reveal the breadth of experiences available inside the 6,150-acre state park. An open-air porch will contain a series of interactive exhibits describing the nine distinct ecologies from the Gulf to the inland forest. A multi-use room is available for reservation by the community and individuals for use as a gathering space for meetings and other events. The at-grade play area includes shade, a water play exhibit, and sky viewing benches. All of these features are tied together by an elevated plaza that provides stunning views of the Gulf of Mexico. The building also includes public restrooms, bike parking, and amphitheater seating. The entire building is the launching point for visitors to move across the newly opened pedestrian bridge that connects the beach to the majority of the park and the twenty-eight-mile trail system. This eastern bridge complements the western pedestrian bridge that was opened earlier this year. Both bridges were included in the Gulf State Park Master Plan in direct response to a public survey describing the number one barrier to pedestrian and bicycling in the park as lack of safe passage across East Beach Boulevard. These two bridges provide separated access for park visitors to the entire trail system and a unique amenity for all park guests. The Interpretive Center is seeking full Living Building certification under the Living Building Challenge awarded by the International Living Future Institute. Widely regarded as the world’s most rigorous environmental certification, the challenge consists of seven performance categories: water, energy, materials, place, beauty, equity and health and happiness. Together, these categories ensure a building performs at the most aspirational levels. In order to meet the challenge, the Interpretive Center will provide 105 percent of its energy, treat 105 percent of its water and was constructed using healthy materials. As of January 2018, there are only 16 fully certified Living Buildings and, if successful in meeting the challenge, the Interpretive Center will be the first of its kind in the southeast. A series of exhibits in the elevated plaza and multi-use room describe how the building responds to the Living Building Challenge and explore the interaction between nature and the built environment. The Interpretive Center is one part of the overall enhancement project. The Dune Restoration was completed in 2016 and is being monitored to inform adaptive management techniques. The Lodge at Gulf State Park, a Hilton Hotel is currently under construction and will open in November 2018. The Learning Campus, which includes overnight accommodations, indoor and outdoor classrooms, laboratories, meeting space and a restaurant that is open to the community, is under construction and will be complete in December 2018. 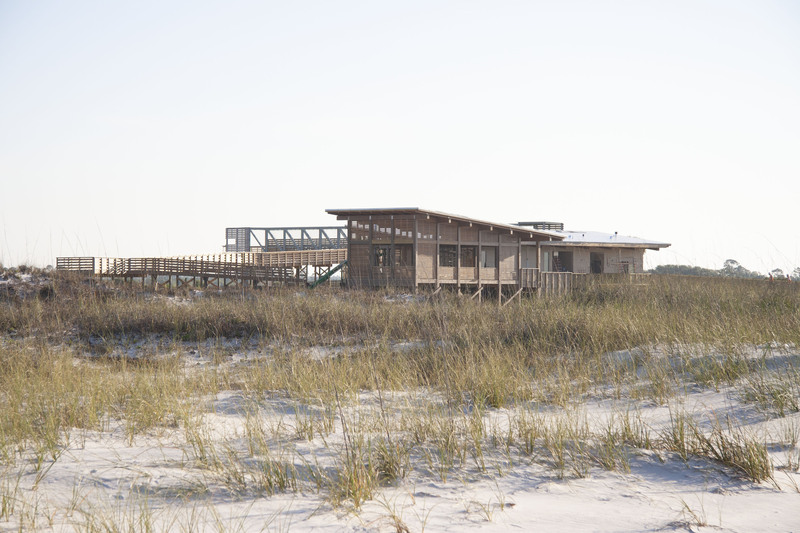 Gulf State Park is an international benchmark of environmental and economic sustainability demonstrating best practices for outdoor recreation, education, and hospitality. The Alabama Department of Conservation and Natural Resources promotes wise stewardship, management and enjoyment of Alabama’s natural resources through four divisions: Marine Resources, State Lands, State Parks, and Wildlife and Freshwater Fisheries. For more information, visit www.outdooralabama.com. Valor Hospitality is a global hospitality management company operating in the USA, UK & Europe, and Africa. For more information, visit www.valorhospitality.com.